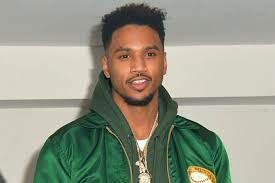 Trey Songz surrendered to LAPD to face a felony domestic violence charge early Monday morning ... TMZ has learned. The singer turned himself in, with his attorney Shawn Holley, for the alleged incident involving a woman he was out with in L.A. last month during NBA All-Star weekend. He was booked at 6 AM, and released shortly after 8 AM. He posted a $50,000 bond. Songz is accused of brutally beating Andrea Buera at a Hollywood Hills party where she claims he was upset because she was talking to another man. Right around the time he surrendered for booking, Songz tweeted, "I am being lied on and falsely accused for someone's personal gain." Buera claims Songz beat her so badly, she suffered a concussion and had to go to a hospital for treatment. She claims several people at the party witnessed the alleged beating. However, Songz claims there are witnesses who refute Buera's allegation. We're told Holley made her case to the arresting detectives that Buera's story is filled with inconsistencies.